While serving at the United States Conference of Catholic Bishops as Executive Director of the Secretariat for the Diaconate, I received a call from a man who told me that he felt a strong call to service as an ordained deacon in the Catholic Church. I told him that was wonderful and that I hoped he would follow through and contact his local diocesan office to begin the necessary application procedures. Then he floored me: "Well, Deacon, I'd like to do that, but I can't. I'm too young!" I asked him how old he was and he said "28." "How old do you think you have to be to be a deacon?" I asked. He said he really didn't know, but that every deacon he'd ever seen was always an old man, so he just figured being a deacon was a ministry designed for older men! Here's another interesting observation: In the United States, the average age of permanent deacons is now nearly 64 years of age. In nearly every other region of the world, the average age of permanent deacons is in the mid-40s! When I travel abroad on diaconate matters, it's not unusual for me to hear how the diaconate in the US is a "retirees' club". Let's set the record straight. Church law states that a MARRIED man should be 35 at the time of ordination as a deacon, and that an unmarried man may be ordained at age 25. In the United States, the bishops have had a long-standing law that ALL candidates for the permanent diaconate, married and single, should be 35 at the time of ordination. This is a US distinction, and not one imposed universally. The reason for the higher age for married candidates is simple and wise: The church wants to make sure that the married couple has been married for a while and has attained a maturity and stability within their marriage prior to adding on the challenges of ordained ministry. However, while 35 is the norm, it is not absolute. The local diocesan bishop can waive a year off of this requirement (and ordain someone at 34), and if the person is younger than that, Rome will dispense another 2 1/2 years if the bishop requests it. This is not all that unusual. Finally, a point from history. 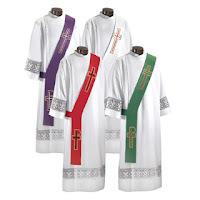 Prior to the Second Vatican Council, 101 proposals were received from bishops around the world discussing the possibility of ordaining permanent deacons, and many of these proposals were in favor of opening ordination to married men "of a mature age." When this "mature age" was discussed before the Council, it was deterimined to be 40. During the the Council debates on the diaconate in 1963, however, the bishops decided that 40 was too old, and they lowered the age to 35. Clearly the bishops anticipated that these new permanent deacons would still be heavily engaged in the raising of their families and in their secular jobs, careers, and professions. The bishops did not foresee a man who had already helped raise a family and who had already retired from his secular occupations in order to "enter the Church" (that's a rather antiquated expression that used to mean "to enter ordained or religious service"). So, with regard to the age of US deacons, we can ponder about why it has developed as it has here, and even more important, what needs to be done to include younger candidates as the Council had envisioned and hoped, and which in fact, are found in other parts of the world. This returns us briefly to the posting a made a few days ago about the formation of deacons. I sometimes hear concerns that one reason younger men do not apply for diaconate formation is because the requirements are now too strict to permit a young married man to participate. However, other formation programs around the world are no less strict, and the requirements for ordination no less substantive. So, how do other countries find their younger married candidates? It's actually quite simple, and a few US dioceses have begun to learn from this model from overseas. Namely, the whole family comes to formation! Most places use a weekend format, where the formation is held over one or perhaps two weekends per month. While in the US, the deacon candidate and perhaps his wife will attend, in other countries, the whole family comes. There is no family separation. A team of qualified child care providers and youth ministers, often composed of qualified volunteers from within the local diaconate community, greets the family upon arrival. The children are gathered and they play games and have their own activities while Mom and Dad are in class. At meals, and at prayer, however, the entire family comes together again throughout the weekend. It works, and is a blessing for the families. Just some more to ponder and discuss. . . .
At the other end of the spectrum, is there a maximum age to enter discernment for the diaconate? In Mexico this summer, we attended a mass where the altar servers seemed especially on the ball. They were vested and ready well before the service began, all but the tiny cross-bearer wearing his Sunday Best but not robes. At the end of mass, the priest introduced the young, newly ordained deacon . . . as well as his sons, all of whom had assisted at the mass. What a beautiful display of the future of the Church! For a future topic. Could you discuss formation and what you wish you would have been taught during it and what you would recommend for others in formation. Meaning, if you knew then what you know now. It would help those of us in formation. No, there is no upper limit set by universal law, or by national particular law. However, each diocesan bishop may decide upon such an age. Although not required by canon law, many bishops ask ALL of their clergy (priests and deacons) to submit letters of retirement at age 75. So, that will often affect at what upper age bishops may accept candidates. I can empathize! When I began formation, I was the youngest in my class; I was 37. I was 40 when I was ordained and my next youngest classmate was 45. After that, the ages jumped significantly. Wow, that's a loaded question! What I have found in the 20+ years I've been a deacon, and in my efforts at diaconate formation over the years, is that often the hardest challenge for new aspirants and candidates is their understanding of the Church itself. By this I mean that many folks come to formation with a very "parish-centered" understanding of the church. The more rapidly this point of view can be broadened, the better. Tied to this is the need to understand HOW the church operates. We tend to have a very Americanized view of the church, and that's not the way "Church universal" works. It's a great question, though, and one that deserves a lot more attention, so let's pursue it in more detail. It's an interesting observation, Bill. I was 34 when I began formation in 2000. I was 38 when I was ordained a deacon in 2004. Now, almost seven years and twenty+ additional permanent deacons ordained in my diocses since, at 44 (45 next month), I am still the youngest deacon in my diocese. I am not even sure that there is another deacon younger than 50. Of course, as recent discussions we have had about clerical continence (my and I have had two additional children since my ordination) have suggested, there is at least one fairly serious proposal to make the minimum age at which a married man can be ordained 50! It becomes clearer to me, as I study the history of the contemporary diaconate closely as part of my graduate program (something with which I was hugely assisted by the church financially) that what you say is absolutely the truth about how the not merely restored, but renewed and expanded, diaconate was envisioned by the council fathers and those from before, going all the way to Passavant's 1840 letter to von Diepenbrock. When I was in my mid twenties and married I had the same thoughts and was told I would have to wait until I was older and my family was established before I would be considered. Fortunately I continued to serve the church in others ways. Then a deacon candidate who was interning at my parish asked if I had considered being a deacon and I told him my story and that I was too young. He just laughed and mad a phone call. Needless to say I applied and was ordained in 2009 at 34. The biggest probably I have is people keep asking me when will I be ordained a priest. My response is usually "I don't think my wife and two kids would appreciate that"
Well sonny, harumph, harumph. I think that is how us old people are supposed to talk. I am one of the happy folks at the high end of the spectrum. I started formation at age 61,(am now 62) and will be ordained, God willing, at age 66. I think a point to ponder is one that I made in my initial scrutiny. I may not have the number of years to serve as a younger man but I bring a whole lifetime of experiences to the table. Hopefully they will give me a quality that will make up for the lack of quantity. Thanks for making a wonderful point. No would would ever suggest that we aren't graced by deacons of mature age like us (I'm 60 myself)! My only concern is with the often rather automatic exclusion of younger applicants as well! God bless you on your journey of formation. I think the big reason we don't have younger deacons in the U.S. is that more and more dioceses are demanding too much spousal involvement especially when there are kids in the family. I was younger than 35 when I entered the program in the Archdiocese of Boston and was ordained 4 years later in 1980. There were a number of other men about my age in the class. But as time goes by more and more seems to be demanded of candidate's wives as far as time and participation are concerned. Maybe that is why men in the newer classes seem much older as a result. But there is a big advantage to the Church having a corps of deacons retired from their secular jobs. I was able to retire early with a good pension and medical coverage. When I retired I told my pastor (we are in a medium-sized one priest parish) that I would be available 24-7 and it really seems to have taken a lot of pressure off him. We seem to forget--in our youth obsessed culture where older people frequently make fools of themselves trying to look or act like teen-agers--that, especially in religion, people of great age have traditionally been regarded as sources of profound wisdom and insight regarding spiritual matters. "I think the big reason we don't have younger deacons in the U.S. is that more and more dioceses are demanding too much spousal involvement especially when there are kids in the family." This is an excellent point and one that needs more serious thought. Certainly nobody is suggesting that deacons who are ordained when they are older aren't a gift to the church, they absolutely are for many, many reasons. When I think about younger deacons, I think about deacons bridging the gap between the church and the world precisely in the work-place and among younger people, taking the church outside the sanctuary in many instances. One of the wonderful thing about being Catholic is that we tend to see things as both/and, not either/or. IT is also true that those of us who are younger now will be older deacons someday, too! OMG,(I think that is how the young folk say Oh my goodness! ), I just came from the Great Lakes Catholic Men's Conference. Aside from a wonderful day of prayer and fellowship I observed the 12 Deacons assiting at Mass. OMG, OMG! We may have a small crisis with a lack of younger Deacons. I know I will be giving more thought and energy into facilitating some of the young pups into getting off their respective duffs. I know there is an interest because I have talked to quite a few. Action sonny! That's what we need. It's time for my nap now. As a 43 year old discerning a call, I can say with certainty, that I couldn't begin formation until my youngest is in high school. How could I be involved with my children, with weekends being a good portion of the quality time, if I am committed to formation? And having my wife participate in formation when kids are home? I don't think so. I was ordained in August 1978 at the age of 34 years--11 months. At the time I was a Deacon-Candidate (1975-78), my wife chose not to be involved in my formation (she had her own profession and we had five children at that time). She and two other wives (in similar situations) simply went very public and reminded the Diocesan Office that the Vatican Norms in effect at that time prohibited any forced involvement of the wives of married deacon-candidates in any formation programming PERIOD. And the wives had the documentation to prove it. I have not read the current Vatican norms closely on this topic so I cannot speak to any current guidelines. If, however, it appears that your diocese is violating the integrity of the deacon-candidates marriage by trying to force the wife into her own formation against current Vatican guidelines, go ahead and challenge them. Thanks for all of the commentary on this issue. I think the point is well made: We need room in our formation programs for candidates of ALL ages. For some families, pursuing this vocation is problematic with younger children at home; for other families, that earlier age is the PERFECT time. In terms of spousal involvement: from a Vatican and national (USCCB) perspective, NOTHING has changed. Spouses are strongly encouraged to participate as much as they can so that they can both grow together with their husbands as well as make a decision that is well-informed about the vocation. It's that first point that is the more important, I believe: It is critically important that the spouses be nurtured together so that formation (of the husband) does not result in any relational problems between the spouses. Still, diocesan staffs have to be sensitive about the obligations of both spouses to their families and secular jobs as well which might preclude MANDATORY participation. As with most things, wisdom lies in a balanced approach. Wives need to be involved to SOME substantive degree in the formation process; that does not mean that they have to attend each and every class and event. Mid-Term Elections and "Gaudium et spes"
Face Down at St. Peter's Tomb -- Literally!